The Touch Twist Utensils makes it easier for individuals with limited hand and wrist flexibility to dine independently. Some elderly people and people with special needs such as cerebral palsy, arthritis, stroke and other neurological limitations, may have difficulty grasping or positioning eating utensils. Touch Twist Utensils eliminates this problem with its unique design and functional features. 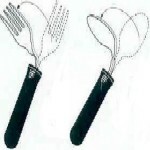 The shaft of the spoons and fork is bendable, allowing for right or left angle use. Individuals with limited wrist movement or hand mobility can angle the utensils in the direction that's best for them while using little hand flexibility. The knife features a curved style blade designed for use in a rocking motion to cut meats, breads or other foods easily with one hand. 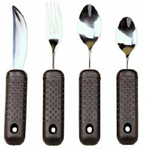 Each utensil has a built-up, firm, rubber grip handle with small, raised, tactile bumps to ensure a good grip and easy grasping. People with limited hand strength or stiffness due to arthritis will find it easy and comfortable to hold on to. The handle also features a large hole on the end. This can be used to strap the utensil to the arm for added security or to hang when not in use. The utensils are all about 8 inches long. The fork has 1 3/4 inch long tines. The tablespoon has a 2 1/2 inch long by 1-1/2 inch wide bowl. The handles are oval shaped - with almost a 4 inch circumference. 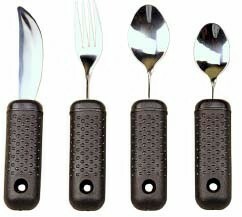 Comes in a set of 4, including a knife, fork, teaspoon and tablespoon. Dishwasher safe.